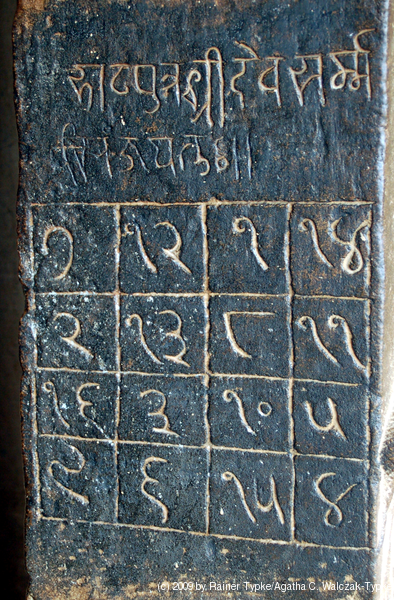 The digit signs have changed in the past thousand years, but it's a quick and fun puzzle to figure out what they mean using only the information that this is, in fact, a magic square. A solution follows. No peeking until you've tried it yourself! so we can guess that the entries are the numbers 1 through 16, as is usual, and the magic sum is 34. The appears in the same position in all the two-digit numbers, so it's the digit 1. The other digit of the numeral is , and this must be zero. If it were otherwise, it would appear on its own, as does for example the from or the from . so that must be an odd number. We know it isn't 1 (because is 1), and it can't be 7 or 9 because appears in the bottom row and there is no 17 or 19. So must be 3 or 5.
so that + = 9. only appears as a single digit and we already used 8 so must be 7 or 9. But 9 is too big, so it must be 7, and then is 2. I like that people look at the right-hand column and immediately see 18 + 11 + 4 + 8 but it's actually 14 + 11 + 5 + 4. This is an extra-special magic square: not only do the ten rows, columns, and diagonals all add up to 34, so do all the four-cell subsquares, so do any four squares arranged symmetrically about the center, and so do all the broken diagonals that you get by wrapping around at the edges. My co-worker X had been collaborating with a front-end designer on a very large change, consisting of about 406 commits in total. The sum of the changes was to add 18 new files of code to implement the back end of the new system, and also to implement the front end, a multitude of additions to both new and already-existing files. Some of the 406 commits modified just the 18 back-end files, some modified just the front-end files, and many modified both. X decided to merge and deploy just the back-end changes, and then, once that was done and appeared successful, to merge the remaining front-end changes. He then added the 18 files to the repo, committed them, and published the resulting commit on master. In due course this was deployed to production without incident. The next day he wanted to go ahead and merge the front-end changes, but he found himself in “a bit of a pickle”. The merge didn't go forward cleanly, perhaps because of other changes that had been made to master in the meantime. And trying to rebase the branch onto the new master was a complete failure. Many of those 406 commits included various edits to the 18 back-end files that no longer made sense now that the finished versions of those files were in the master branch he was trying to rebase onto. So the problem is: how to land the rest of the changes in those 406 commits, preferably without losing the commit history and messages. The easiest strategy in a case like this is usually to back in time: If the problem was caused by the unorthodox checkout-add-commit, then reset master to the point before that happened and try doing it a different way. That strategy wasn't available because X had already published the master with his back-end files, and a hundred other programmers had copies of them. The way I eventually proceeded was to rebase the 406-commit work branch onto the current master, but to tell Git meantime that conflicts in the 18 back-end files should be ignored, because the version of those files on the master branch was already perfect. There's no direct way to tell Git to ignore merge conflicts in exactly 18 files, but there is a hack you can use to get the same effect. The repo can contain a .gitattributes file that lets you specify certain per-file options. 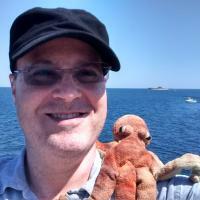 For example, you can use .gitattributes to say that the files in a certain directory are text, that when they are checked out the line terminators should be converted to whatever the local machine's line terminator convention is, and they should be converted back to NLs when changes are committed. With the merge attribute set to union for this file, Git automatically chooses the correct resolution. So, returning to our pickle, I wanted to set the merge attribute for the 18 back-end files to tell Git to always choose the version already in master, and always ignore the changes from the branch I was merging. There is not exactly a way to do this, but the mechanism that is provided is extremely general, and it is not hard to get it to do what we want in this case. The name is just a human-readable description and is ignored by Git. The important part is the deceptively simple-appearing driver = true line. The driver is actually a command that is run when there is a merge conflict. The command is run with the names of three files containing different versions of the target file: the main file being merged into, and temporary files containing the version with the conflicting changes and the common ancestor of the first two files. It is the job of the driver command to examine the three files, figure out how to resolve the conflict, and modify the main file appropriately. In this case merging the two or three versions of the file is very simple. The main version is the one on the master branch, already perfect. The proposed changes are superfluous, and we want to ignore them. To modify the main file appropriately, our merge driver command needs to do exactly nothing. Unix helpfully provides a command that does exactly nothing, called true, so that's what we tell Git to use to resolve merge conflicts. With this configured, and the changes to .gitattributes checked in, I was able to rebase the 406-commit topic branch onto the current master. There were some minor issues to work around, so it was not quite routine, but the problem was basically solved and it wasn't a giant pain. I don't remember why I thought this would be a better idea than just using git-rebase, which is basically the same thing. (Superstitious anxiety, perhaps.) But I think the process and the result were pretty much the same. The main drawback of my approach is that if one of the cherry-picks fails, and the loop exits prematurely, you have to hand-edit the commit-ids file before you restart the loop, to remove the commits that were successfully picked. and stops and waits for manual confirmation. Since 140 of the 406 commits modified only the 18 perfect files I was going to have to intervene manually 140 times. I wanted an option that told git-cherry-pick that empty commits were okay and just to ignore them entirely, but that option isn't in there. There is something almost as good though; you can supply --keep-redundant-commits and instead of failing it will go ahead and create commits that make no changes. So I ended up with a branch with 406 commits of which 140 were empty. Then a second git-rebase eliminated them, because the default behavior of git-rebase is to discard empty commits. I would have needed that final rebase anyway, because I had to throw away the extra commit I added at the beginning to check in the changes to the .gitattributes file. There were three or four remaining conflicts during the giant rebase, all resulting from the following situation: Some of the back-end files were created under different names, edited, and later moved into their final positions. The commits that renamed them had unresolvable conflicts: the commit said to rename A to B, but to Git's surprise B already existed with different contents. Git quite properly refused to resolve these itself. I handled each of these cases manually by deleting A.
I don't want anyone to think that I already had all this stuff up my sleeve, so I should probably mention that there was quite a bit of this I didn't know beforehand. The merge driver stuff was all new to me, and I had to work around the empty-commit issue on the fly. Also, I didn't find a working solution on the first try; this was my second idea. My notes say that I thought my first idea would probably work but that it would have required more effort than what I described above, so I put it aside planning to take it up again if the merge driver approach didn't work. I forget what the first idea was, unfortunately. This is a minor, peripheral technique which I think is important for everyone to know, because it pays off far out of proportion to how easy it is to learn. Instead of trying to remember the commit IDs for these I just gave them mnemonic names with git-branch: last, first, and base, respectively. That enabled commands like git log base..last … which would otherwise have been troublesome to construct. Civilization advances by extending the number of important operations which we can perform without thinking of them. When you're thinking "okay, now I need to rebase this branch" you don't want to derail the train of thought to remember where the bottom of the branch is every time. Being able to refer to it as first is a big help. After it was all over I tried to answer the question “What should X have done in the first place to avoid the pickle?” But I couldn't think of anything, so I asked Rik Signes. Rik immediately said that X should have used git-filter-branch to separate the 406 commits into two branches, branch A with just the changes to the 18 back-end files and branch B with just the changes to the other files. (The two branches together would have had more than 406 commits, since a commit that changed both back-end and front-end files would be represented in both branches.) Then he would have had no trouble landing branch A on master and, after it was deployed, landing branch B. At that point I realized that git-filter-branch also provided a less peculiar way out of the pickle once we were in: Instead of using my merge driver approach, I could have filtered the original topic branch to produce just branch B, which would have rebased onto master just fine. I was aware that git-filter-branch was not part of my personal toolkit, but I was unaware of the extent of my unawareness. I would have hoped that even if I hadn't known exactly how to use it, I would at least have been able to think of using it. I plan to set aside an hour or two soon to do nothing but mess around with git-filter-branch so that next time something like this happens I can at least consider using it. It occurred to me while I was writing this that it would probably have worked to make one commit on master to remove the back-end files again, and then rebase the entire topic branch onto that commit. But I didn't think of it at the time. And it's not as good as what I did do, which left the history as clean as was possible at that point. I think I've written before that this profusion of solutions is the sign of a well-designed system. The tools and concepts are powerful, and can be combined in many ways to solve many problems that the designers didn't foresee. An earlier article discussed how I discovered that a hoax item in a Wikipedia list had become the official name of a mountain, Ysolo Mons, on the planet Ceres. Thank you for your email alerting us to the possibility that the name Ysolo, as a festival name, may be fictitious. After some research, we agreed with your assessment. The IAU and the Dawn Team discussed the matter and decided that the best solution was to replace the name Ysolo Mons with Yamor Mons, named for the corn/maize festival in Ecuador. The WGPSN voted to approve the change. Thank you for bringing the matter to our attention. This week we cleaned up a few relevant Wikipedia articles, including one on Italian Wikipedia, and Ysolo has been put to rest. I am a little bit sad to see it go. It was fun while it lasted. But I am really pleased about the outcome. Noticing the hoax, following it up, and correcting the name of this mountain is not a large or an important thing, but it's a thing that very few people could have done at all, one that required my particular combination of unusual talents. Those opportunities are seldom.